The security services would cross check the documents with their own information to provide “vital pieces of the intelligence jigsaw”. They reveal that Isis has set up a human resources centre that requires “entrance interviews” from recruits. A 23-question survey gives their names, birth dates, nationalities, home towns and even blood types. Prospective members were asked to choose between being used as suicide bombers, soldiers or in another role, and to detail any previous “jihadist experience”. Security agencies including MI5 and MI6 were examining the documents last night to verify their authenticity. Only a small portion of the cache is thought to have been released so far. The 1,736 documents, stamped with the black flag of the “caliphate”, reveal that Isis has recruited jihadists from more than 50 countries. More than 70% are Arabs while the majority of European recruits are from France, followed by Germany and Britain. A larger cache of documents obtained by Sky News is understood to contain the details of dozens of Britons, some thought to be based in the UK. The man who stole the cache was a Free Syrian Army convert to Isis, according to Sky News. He quit the terrorist group claiming that it had been overrun by former soldiers from the Iraqi Baath party of Saddam Hussein and was no longer following Islamic rules. The leak allegedly came on a memory stick stolen from the head of Isis’s internal security police. The Britons on the list include three well-known jihadists, two of whom have been killed in drone strikes. Reyaad Khan, 21, who was born in Cardiff. Also among the files was Junaid Hussein and Abdel Majid Abdel Bary, 26, who is known to have had links to Mohammed Emwazi,. Three of the Paris Carnage attackers, Omar Ismail Mostefai, Samy Amimour and Foued Mohamed-ggad are also named in the files (the Bataclan team ) . Overall numbers of Isis foreign fighters estimated by the US government have begun to drop as Syria becomes harder to access and the group takes heavy losses. USA officials said last month that the number had dropped to between 19,000 and 25,000 from a peak of 35,000. WARNING !! ISIS leaked documents can be and probably are a huge deceptions – like all intelligence deceptions it contains true reliable details, already known to the client, to create credibility to the other details. Anyhow since the documents are marked with the “Islamic State in Syria and the Levant” and the organisation changed its name officially, almost two years ago,. 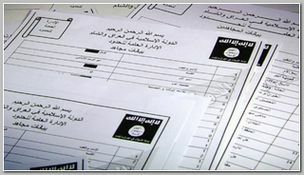 in 06/2014,.just to the “Islamic State” it seems that most of the information in the documents is old and not updated . Some experts who are familiar with the information in the disk-on-key indeed believe so. « TAIROD NATHAN WEBSTER PUGH FOUND GUILTY !